A water release was made this morning from Prettyboy Dam to raise water levels in Loch Raven Reservoir. The shop was informed that these flows should continue through this week into the weekend, and possibly the following week. The Gunpowder was ice cold all Summer at a medium to lower flow (5 times the bare minimum, and nearly double the dreaded 30 Cfs flow), but now is climbing to an early Spring level in the 115 CFs range. 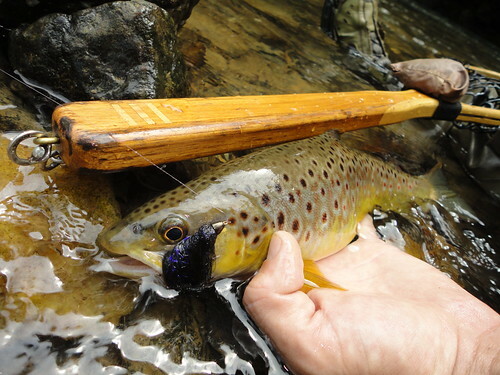 The conditions and fishing on the Gunpowder prior to the release really favor dry fly fishing. 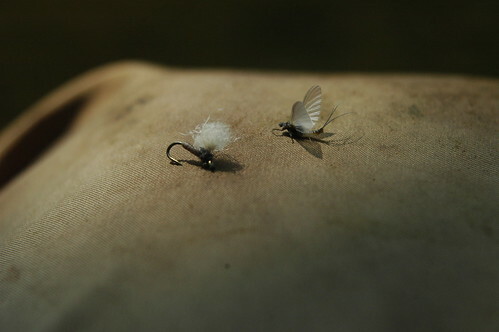 The trico hatch in the mornings and caddis hatches midday get the trout looking to the surface. Now the higher flows can be good for dries, nymphs or streamers. Last week Matt and I returned from WMD to take advantage of the good fishing on the Gunpowder. We started out the morning by locating a good hatch cloud of tricos and rising trout. The flurry of activity continued for over an hour before only a few fish rose sporadically. We caught over a dozen between us before moving into some riffles using caddis dries. 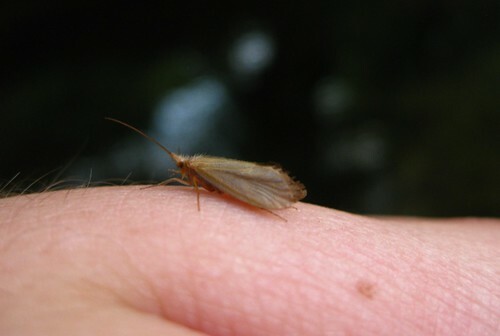 Caddis began hatching and soon a few splashy rises resulted in two hours of great fishing. The two of us covered a lot of water, working the caddis to rising fish or fished blind. 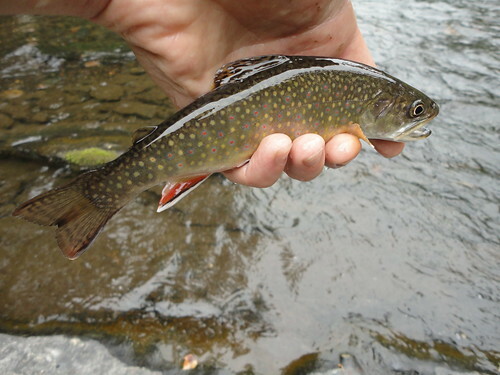 I caught this brook trout below in a riffle after seeing a caddis get smacked only moments ago. The wild browns we caught were the typical 7 to 10 inch trout eager to eat dries, but we caught some larger browns between 11 and 13 inches. The action was consistent, and some riffles produced multiple trout. In one riffle I landed 7 browns without moving more than a few steps. By late afternoon the caddis hatch slowed, so we put on some caddis pupa patterns. The fish that were unwilling to rise were willing to eat our patterns subsurface. We ended the day with a lot of pretty wild browns on dries. The fishing was a change of pace from fishing the Savage days earlier, where we worked very hard for far fewer, but larger trout. We did locate one huge fish I call “the Salmon” that is among a bunch of big browns that reside in the Gunpowder, which are rarely caught. Matt drifted the biggest, heaviest nymph I had past a fifteen-sixteen inch brown we spotted on the bottom. We were shocked when a much larger brown appeared and spooked the smaller trout. We never knew for certain if the big fish ate the fly, but it swam three feet from its lair, and rolled slightly on its side before heading back to its hiding spot. The indicator never moved, but it was possible the fish hit-and-spit the fly. It was good to see this fish willing to move to a fly, because in the past I’ve tried and it usually spooks on the first cast. 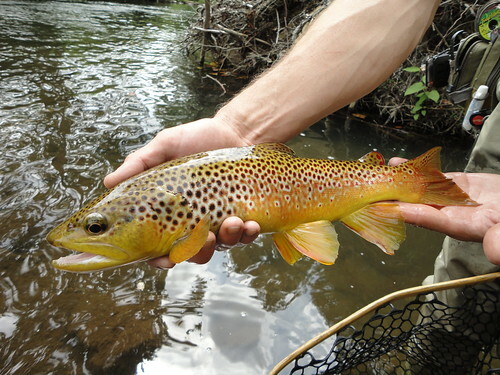 The latest video post features some browns we caught on the Gunpowder, tricos and a slate drake mayfly. This entry was posted in fishing report, video on August 31, 2010 by Jason du Pont. Want to connect with one of these? The shop is now offering fly fishing skills clinics, in addition to schools and guide trips through September. Backwater Angler Guides will be teaching a variety of clinics including; nymphing, terrestrials, streamers and small flies. These clinics are ideal for beginner to intermediate anglers, and especially helpful for experienced anglers that might need a “brush-up” on techniques prior to a destination trip. Each clinic covers gear, techniques, and fly selection. Clinics are held from 5:00 PM till 7:00 PM on Wednesdays during September. Cost is $75 per person and participants should bring their own gear. Please give us a call at 410-357-9557 or drop us a line at info@backwaterangler.com to pre-register. Clinics are held on the Gunpowder river by a Maryland state licensed and insured fishing guide. Each clinic is limited to three anglers. This entry was posted in events, news on August 31, 2010 by Theaux Le Gardeur. My buddy Matt was in town, so we decided to head to the Savage for a few days fishing. We arrived just before dark on Sunday and set up camp. On Monday morning we started on a stretch that has proven productive this year, and holds some nice trout. We were both fishing with nymph rigs on 5X tippet. Three casts into the first pool, and I set the hook when the indicator stopped. The brown above got the blood pumping before I directed it out of the faster water and into the net. This trout was only fifteen inches, but was built like a much larger fish with big fins, large head and thick girth. The markings on this trout definitely puts it into contention for one of my prettiest trout this year. We fished all day using small nymphs, midges and caddis pupa patterns. The fishing was tough at times, but I did manage a brown-bow-brookie slam. On Tuesday rain brought out some blue wing olives but the trout never started rising. We caught some fish on small nymphs, before leaving around 2 pm. We caught twenty trout between us after a day and half of fishing, mainly browns 9-15 inches, rainbows 12-13 inches and brookies 7-11 inches. We decided to drive back to fish the Gunpowder for a few days, and take advantage of the good dry fly fishing. The latest video post features the trout we caught while fishing the Savage river in late August. This entry was posted in fishing report, video on August 28, 2010 by Jason du Pont. The river is flowing at 50 Cfs is clear and 51 F. We’ve had numerous reports of Olives along the river. Most of these are in the #18-20 range and we have plenty of snowshoe duns and emergers From Mike Bachkosky in the muffin tins on the front counter. The fish are looking up and the weather has been superb. While we’re not seeing blanket hatches, tricos are massing most mornings throughout the catch and release section. When in doubt use a #16 bead head pheasant tail in the riffles between Falls Rd and Bunkerhill. Summer is fleeting and we’ve had exceptional dry fly fishing. You could be doing far worse than trying your luck on the Gunpowder this weekend. This entry was posted in fishing report on August 27, 2010 by Theaux Le Gardeur. Thanks to Sera Janson Zegre, Project Manager from Downstream Strategies who asked us to distribute this call to action. I am writing to ask for your help with an important study seeking to calculate the economic benefits of water-based recreation on the North Branch of the Potomac. Sponsored by Garrett County, Maryland (fiscal agent), Appalachian Regional Commission, Maryland Department of the Environment, and Maryland Division of Natural Resources, this research seeks to calculate the local economic benefits generated from water-based recreation on the North Branch Potomac River, made possible by the clean-up of acid mine drainage (AMD) from abandoned mine lands in Garrett and Allegany counties. Results will inform future funding decisions so that remediation continues. We are surveying different user groups (e.g., boaters, anglers) of the North Branch to determine how much they value the clean water. We need boaters and anglers to complete a short (10 minute) survey; it doesn’t matter if you’ve been to the area or not. Your email will only be used for the purposes of this survey. Your survey response will be kept confidential; participation is voluntary. Thanks in advance to those who are interested! This entry was posted in news on August 25, 2010 by Theaux Le Gardeur. Thanks to Roman for the report and to Adrian for the great photos. We drove up north a few days ago to help Adrian with moving into his new apartment up at Dartmouth. While in the north country, we just had to take a few days off to do some fishing.From Hanover, we continued 3 hours north to the far northern-most tip of New Hampshire to the headwaters of the Connecticut River where we spent a few days catching trout. Not only were the mid 60s temperatures an absolute pleasure after the sweltering heat back home, but the fishing (and the catching) was excellent. In the trophy stretch, the water was flowing clear at around 150 cfs and 61°. There was a smattering of caddis and blue wing olives and imitations of these were successful at bringing fish to the surface. However, the fish were more interested in feeding below the surface and we found the pheasant tail nymph to be the perfect tool for fooling the trout. 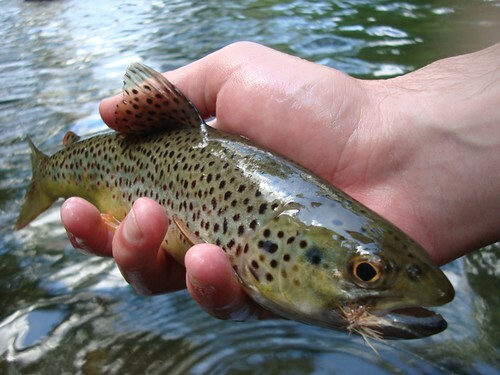 We caught numerous trout over 12″, several over 15″ – almost all of them fat rainbows and putting up a good fight. Included in our catch were also several brook trout -the best of these was caught by Adrian – a fat brookie that we estimated at about 20″. From there, we drove south to do a couple of days backpacking in the White Mountains. I wish we had another few days to spend up here but reality forces me to come back home. Fortunately there are fish awaiting in the Gunpowder! This entry was posted in fishing report on August 19, 2010 by Theaux Le Gardeur. 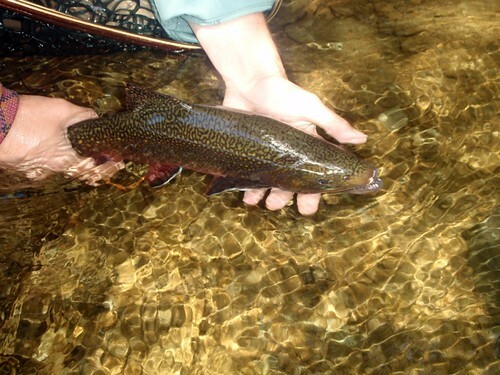 The Gunpowder River is the ideal destination for trout fishing in late Summer. 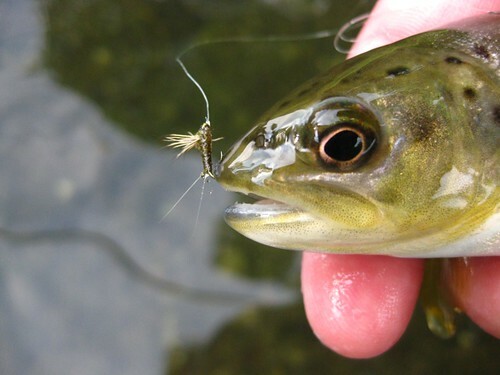 The prolonged high air temps and lack of rain have basically shut down trout fishing on freestone streams in Maryland, Pennsylvania and New Jersey. 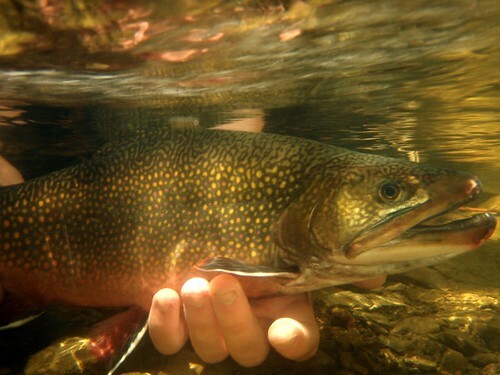 Low flows are not the big problem, but the warmer water temps over 70 degrees can be too stressful on trout. Fortunately the frigid bottom release from Prettyboy Dam offers refuge from the hot air temps, and allows us to fish the Gunpowder without concern. Yesterday I was curious just how much river was fishable based on water temperature. The Falls Rd area is 48 degrees, and roughly six miles down river warms to 57 at Blue Mount Rd. I took a temp of 61 degrees at 1 pm by the Monkton Rd Bridge. Anglers may not encounter high water temps until they reach the Glencoe Rd section, which means there are more than eleven miles of river below 65 degrees. Last Thursday when heavy rains moved through the region, the river rose but quickly cleared above Masemore Rd. The sections down river were stained from the tributaries running high and off color, but remained fishable. The river had 8-10 inches of visibility with a lot of leaves, sticks and other debris in the water. I hoped the trout would be in feeding mode and rigged two nymphs on 5X under a Thingamabobber. The next few hours it was steady action, browns from six to twelve inches, before a late afternoon storm chased me off the water. On Friday afternoon I took my girlfriend out to catch some browns gorging themselves in the murky water, but the river was clear. She caught a few browns and missed some strikes in an hour of fishing. More storms passed through over the weekend, so I spent Monday searching for cloudy sections of the river. In an hour of nymphing I landed six browns before switching to a streamer. The brown above measured fifteen inches and my next brown was just shy of fourteen inches. In the latest video post I filmed a few browns I caught yesterday on the Gunpowder. This entry was posted in fishing report, video on August 17, 2010 by Jason du Pont. 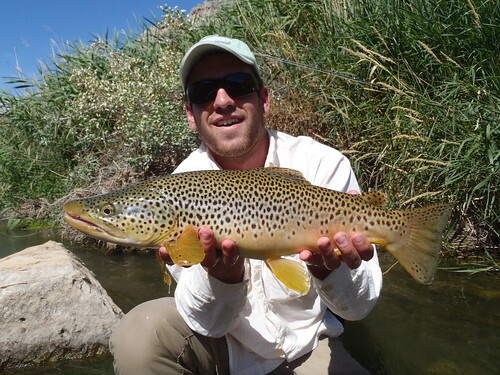 Brad Boyer sent in this picture of a gorgeous brown trout he caught on a recent trip out West. I’m one of Alex McCrickard’s friends and I stop by the shop quite often. Just got back from fishing the Wind River Canyon near Dubois, Wyoming. Had an awesome trip mainly fishing the Wind River and it’s tributaries. The fish were caught on a hopper dropper set up, the hopper was a variation of a Fat Albert and the dropper was a halfback nymph size 12. Here are a couple pictures I thought I’d share from the trip. This entry was posted in fishing report on August 15, 2010 by Jason du Pont. The morning trico hatch on the Gunpowder is pretty late compared to most streams. The fish start rising after 9 am until 11:30, and sometimes continue rising until 1 pm. On Monday I fished a section of river in the morning with decent hatch clouds of tricos, but not a lot of fish rising. The interesting part of the day was around 3 pm when trout started rising everywhere. 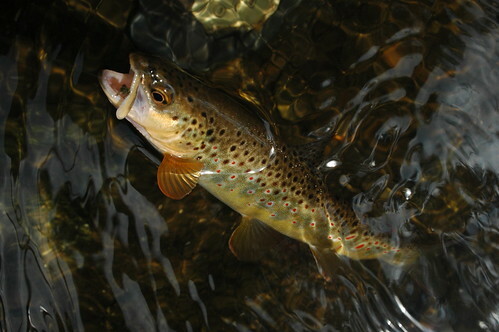 I noticed a lot of female tricos emerging and the trout were quickly sipping them off the surface. The tricos in the air even grabbed the attention of some birds, including a few hummingbirds. I snapped the photo above of a freshly hatched trico next to a size 24 trico pattern. Lately the mornings have been best for spinnerfalls, but good numbers of duns are also hatching in the afternoons. Blue wing olives are hatching on cloudy days, early mornings and late afternoons. Last year both hatches stayed pretty consistent until November, so anglers have months to explore different areas to find the heaviest concentrations of mayflies. 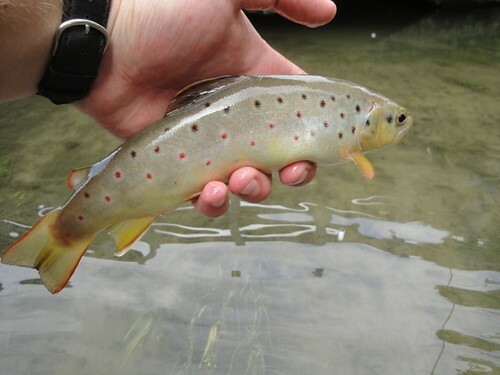 In the latest video post I filmed the afternoon trico hatch and browns sipping them off the surface. I included some pretty wild browns I caught on the Gunpowder in the 100th video post on the Backwater Angler website. To all the viewers out there, thanks for watching and stay tuned! This entry was posted in fishing report, video on August 11, 2010 by Jason du Pont. I recently spent a few day trips fishing some of the limestone spring creeks in south central Pennsylvania. 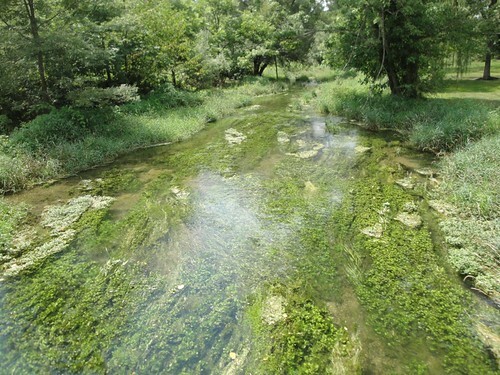 The Letort Spring Run and Big Springs are two fantastic streams in close proximity to Carlisle–add in Falling Springs Branch near Chambersburg and you have three of the best spring creeks east of the Rocky Mountains. Fishing these spring creeks is much different from your average trip to the Gunpowder River. This is mostly due to the change in water characteristics. The wild browns and rainbows that reside in these spring creeks demand extreme stealth and perfect presentation. With a narrow stream bed and excessive aquatic plant growth like cress beds, a perfect presentation can be hard to achieve. Add in strange currents and densely overhanging trees and catching trout can become difficult. Like the Gunpowder, trico mayflies are currently hatching out in the mornings on these spring creeks. The spinner falls have been thick but begin a little earlier, around 8 am. Small BWOs may start hatching as well if the bright sun changes to cloud cover and drizzle. Expect to see sporadic tan and brown caddis in the size # 16 range emerging throughout the afternoon. I have been doing well fishing small terrestrials like ants and beetles tight to the banks. A size # 18 black rubber leg Rainys foam beetle worked well underneath bridges and trees. As always, fish cress bugs and scuds in between the cress beds on these spring creeks. These small crustaceans account for a large portion of the trouts diet. On separate days I caught nearly a half dozen wild browns from Letort and Falling Springs. Most of the fish were in the 8 to 12 inch range. Falling Springs tends to produce more rainbows than the Letort and you can expect to catch many chunky bows in the 6 to 10 inch range. I did land a nicer wild rainbow of 15 inches in Falling Springs one afternoon. I lost a considerably larger fish of around 18 inches the same day while nymphing in a fast run. The fish easily broke me off on 6x tippet. Remember to wash your boots and waders in a salt solution, rinse with freshwater and allow ample drying time before heading to other streams after fishing in the Gunpowder. Its important that we try to control the spread of Didymo. This entry was posted in fishing report on August 10, 2010 by Alex McCrickard.